Lot Detail - Barry Cullen's Late-1950s Toronto Maple Leafs Game-Worn Wool Jersey - Photo-Matched! 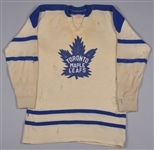 Barry Cullen's Late-1950s Toronto Maple Leafs Game-Worn Wool Jersey - Photo-Matched! One of three hockey siblings, Barry Cullen first started with the St. Catharines Teepees in the OHA in the mid-1950s, and with his 72 points scored in just 67 games for the Winnipeg Warriors in 1955-56, received the attention of the Toronto Maple Leafs. Three full seasons would be spent with the Blue and White, before a final NHL season with Detroit, in 1959-60. 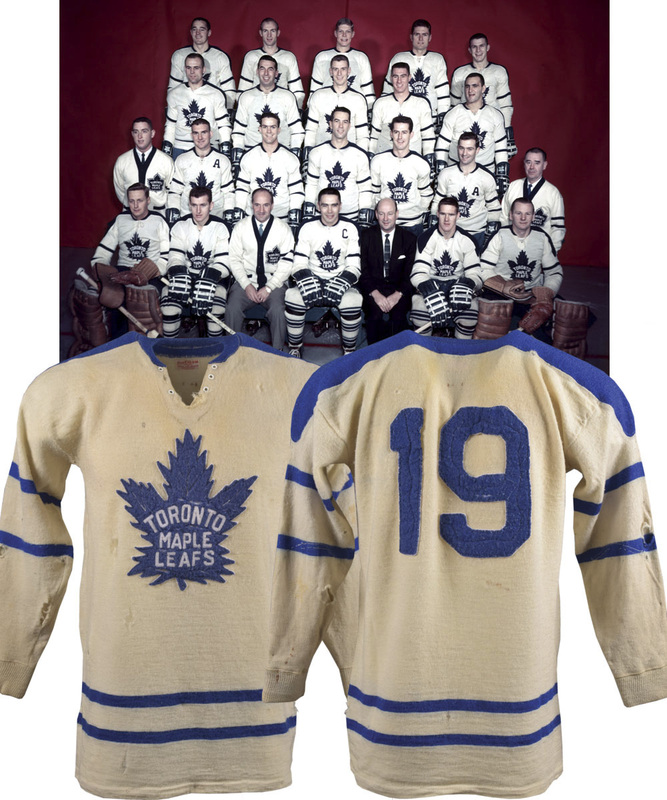 We have a Toronto Maple Leafs wool sweater that was worn by the Ottawa native circa 1958-59, with this highly desirable specimen photo-matched. A label from MLG supplier Doug Laurie sits affixed to the collar, with the vintage sweater measuring-out across the upper reverse to roughly a modern size 46. A detailed felt Maple Leafs team crest with white accent threading sits over the chest with “Toronto Maple Leafs” appliqued, with “19” over the verso in thick blue felt, affixed through zig-zag pattern attachment. The familiar blue striping bands have also been utilized over the sleeves and waist, with six-eyelet configuration on tie-neck construction. Hailing from the pinnacle of Original Six hockey, this vintage Toronto wool is deserving of prominent display. A few large holes are present near and beneath the team crest, with additional examples of varying sizes over each sleeve. Each armpits section is slightly torn along with the front of the collar, with just a single eyelet grommet missing. A few marks are also visible over each sleeve, along with some minor and small rust-coloured stains over the left cuff and beneath the reverse neckline. There is a bit of material loss to the team crest in a few spots, with a small section of missing threading on the reverse “1”. Despite the considerable issues, the jersey displays beautifully with the material remaining supple, with the heavy wear witness to its thorough use. An included numeric image has been matched to the specific shape, placement and particularities of the intricate team crest.